Illinois public schools are mirroring a significant national trend in student demographics: an overall reduction in enrolled students combined with a rising percentage of students coming from low income households. Half of Illinois’ public schools have seen an enrollment decline of greater than 5% since 2007. With the drop in birth rates during the “Great Recession,” even more can expect to find themselves in this position in the future as kindergarten enrollments decline. Reduced enrollment combined with student demographic changes can present a number of challenges for the school district administrator. Click the image to view the infographic. Scroll down to read the blog. Most state and federal education funding is computed on a per student basis. Especially in the unrestricted aid realm, a decline in students will result in a decline in revenues. This may or may not be impactful to a district’s budget depending upon its reliance on those sources. From a budget perspective, there may be a significant disconnect between these count-based revenues and the necessary expenses incurred to serve a student population…particularly, one that is experiencing a declining economic profile. Since 2007, Illinois has seen the percentage of students from low-income households grow from 40% to over 48% in 2013. While in some school districts this may generate additional revenues, the changing demographics of the student population may also be a significant driver of future cost increases. The assumption that, as enrollment declines, a district can reduce staffing and related classroom expenses, may not be realistic. The trends in enrollment and demographics, along with a myriad of other complex issues in education, are highlighting the need for schools to use data analytics and benchmarking tools to drive performance. In a persistently constrained budget environment, resource allocation is becoming the critical management task for school leaders. An analytical approach to data can help meet the educational needs of a changing student population. 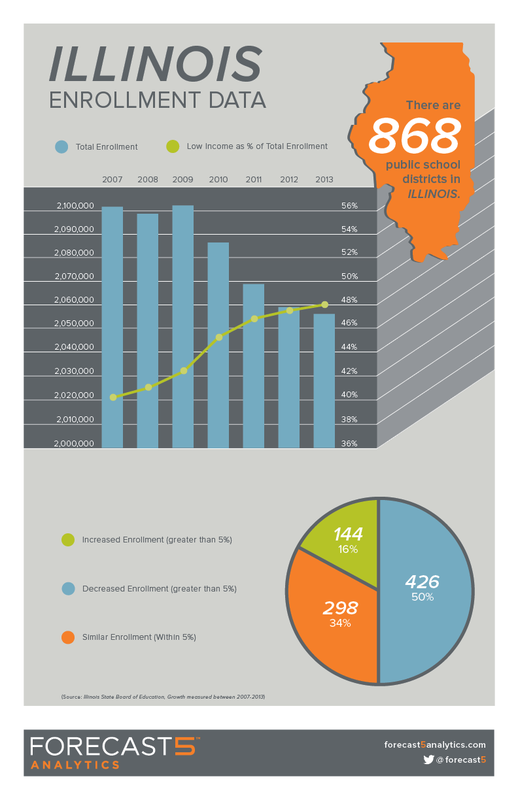 Click here to view the full Illinois Enrollment infographic.